Hoa Lu is the ancient capital of the Dinh and Le dynasties which dates back to the 11th century. 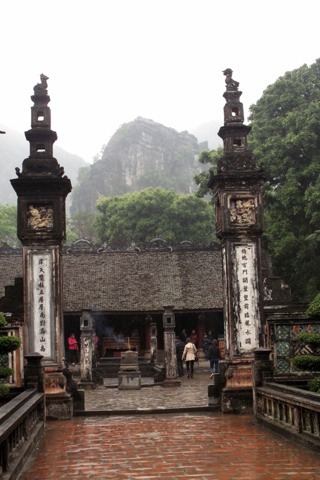 Browse places to stay in Ninh Binh on Booking.com. Book Now - Pay Only When You Stay. Serene and tranquil, it is set in beautiful surroundings beside to Truong Yen village and is easily visited on a day trip from Ninh Binh. However, as beautiful as the surroundings may be, the remains themselves are really non-existent, with the only buildings of interest being some temples which have been built on the old sites. Those still standing include the Dinh Tien Huang, the royal temple which houses a statue of Emperor Dinh Bo Linh and his sons, and the royal temple of the early Le Dynasty. If you’ve had your fill of temples, there won’t be much here to entice you, although it’s worth popping in if you combine with a boat trip around nearby Trang An and a visit to the Bai Dinh Pagoda complex. If you do visit, we’d highly recommend taking a guide to get the most out of your visit, as you won’t find any information at the site. Travel info Hoa Lu is 14km from Ninh Binh railway station, taking around fifteen minutes to reach by motorbike. From Ninh Binh, head north on Tran Hung Dao then about 2 kilometres after the big junction by the bus station take a left onto Duong Trang An -- it’s an extremely wide road with a large gated entrance less than 500m down, so you can’t miss it. Follow this road -- appreciating the scenery en route -- and eventually you will pass Trang An boat station. Hoa Lu is a few kilometres further on, keep to the right at the fork in the road. The roads are good quality but you will have to contend with tour buses. Fill up with petrol on Tran Hung Dao near the junction of Duong Trang An if you need to. Entry is 10,000VND / person with parking at 15,000VND for a motorbike. Hoa Lu is 14km from Ninh Binh railway station, taking only fifteen minutes to reach by motorbike.